If you have fine or thinning hair, get your hairdresser to cut in some layers. Layering the hair will give it more body and volume, so no one will notice that it may be a little on the thin side! Layering works on both shorter and longer hairstyles and will be something any hairdresser can do for you. Another great way to hide thinning and create volume is to blow dry your hair upside down. This may sound rather odd but it pulls the hair away from the scalp and gives it a fuller finish. Using Velcro rollers or a volume-adding mousse will also give the hair more oomph! Don’t fancy trying the upside down trick? Try blow drying your hair with a round brush instead, making sure to gently pull it away from the scalp at the roots. Hair accessories like scarves, headbands and hair clips, are great for hiding any small bald patches. They’ll draw the attention away from any thinning you have and leave you looking and feeling wonderful in the process! If you have a little extra time in the morning, try experimenting with a new parting. Changing from a centre to a side parting or even a zig zag parting may help you to cover up any bald patches and make your hair look thicker. It will take some getting used to but it’s a great way to achieve a new look without spending a fortune! Deep side partings are currently very fashionable and look particularly great on those with long hair. Try parting your hair at the side and then sweeping it back into a messy ponytail. It’s one of those hairstyles that will look perfect whether you’re heading to the office or out with friends. Adding a few waves to your hair and using a texturising spray will give your hair a gorgeous beachy look and hide its thinness. If you’re worried about using heat on your hair, try sleeping in loose plaits or gently scrunching the hair whilst damp instead. If you are up for changing your hair style completely and want to cover up any thinning in the process, why not ask your hairdresser for a choppy, short style? A hairstyle like this is very low maintenance and will have you feeling confident and youthful in no time. If you’re not so great when it comes to styling your hair, ask your hairdresser if there are any simple tricks they can teach you to help you hide their thinning. Most hairdressers will be more than happy to help you and may even be able to suggest a style that we haven’t thought of! Of course, if you’re feeling down in the dumps about your thinning hair, hair transplants are always an option. 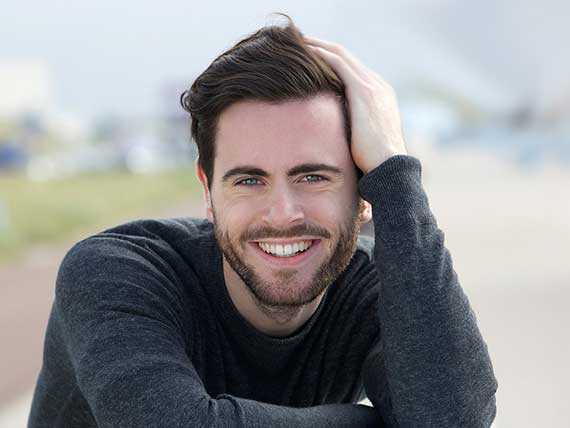 Here at The Wimpole Clinic we can help you regain a full head of thick, beautiful hair. For more information, take a look at our treatments page or give us a call on 020 7935 1861 to book a consultation.